Ever wonder what goes on inside a marine research laboratory? Join us for our annual open house to find out! 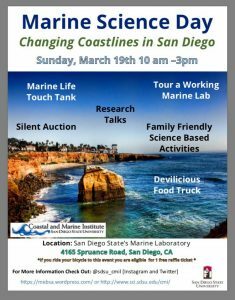 This is a free event open to all ages, featuring fun activities such as a marine life touch tank, family friendly science based activities, research talks, lab tours, silent auction, and much more! This event takes place on Sunday, March 19, 10 am – 3 pm. Parking and admission are free. For more information visit: CMIL Marine Science Day. We hope to see you there!